HomeBangkokTuk Tuk Bangkok Night Tour! Wat Yannawa : is an old Buddhist temple (wat) dating back to the Ayutthaya period, located in the Sathon district of Bangkok on Charoen Krung Road, Bangkok, Thailand. It has a unique junk shaped chedi and viharn built by King Rama III. Take A Walk To Visit Local Lifestyle and Try the Thai dessert Awesome ! Visit The Democracy Monument is a public monument in the centre of Bangkok, capital of Thailand. It occupies a traffic circle on the wide east-west Ratchadamnoen Klang Road. We will take TUK-TUK driver go to Flower Market (Pak Klong Talad) is a market in Bangkok, Thailand that sells flowers, fruits, and vegetables. It is the primary flower market in Bangkok and has been cited as a place of symbolic values to Bangkok residen. Walk Go to "Yodpiman River Walk" for Chill Out Beer Garden. Yodpiman River Walk is a lifestyle mall focusing very much in keeping with the feel of Old City Bangkok. a large beer garden with live night time entertainment. We will take TUK-TUK driver us around Bangkok and go to "Yaowarat Road" At night, Yaowarat Road - the high street of Bangkok’s Chinatown It can be confusing at first but with a sense of adventure it can be a lot of fun. End of the Trip ! Goodbyes are not forever. Goodbyes are not the end. Until we hope meet again! This wonderful place to Walking tours throughout the trip. You’ve Never Seen Before gifts and food is all very reasonably priced and plentiful. This was a wonderful experience ! Thank you Cheryl and you friend for joining with me. on a special night ! Had the most wonderful time. Everything was exactly how I imagined for my first visit to Thailand. So much culture and fun it was the best night. 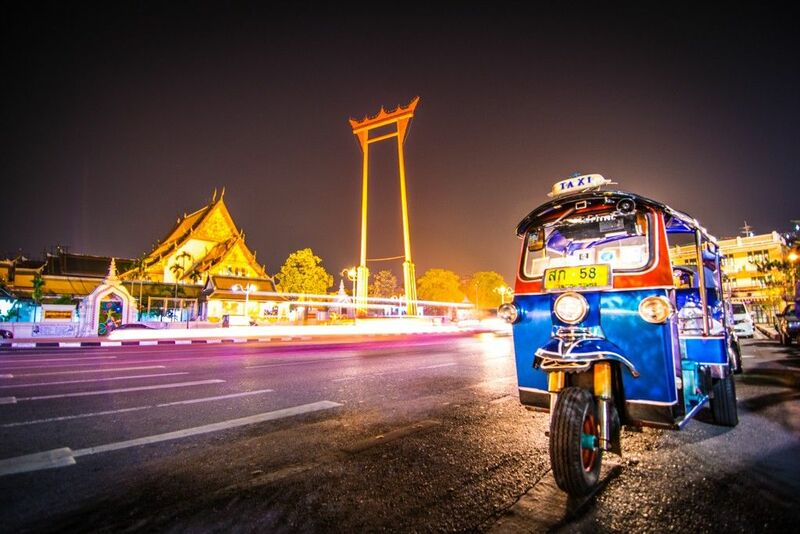 Siriphong’s Tuk Tuk tour is a great way to see Bangkok. He takes you to parts of Bangkok that most tourists din’t Get to see. The evening is capped off with a few cold beers and dinner at a riverside restaurant. Thank you for joining with me. on a special night !